﻿ Iniesta: "Cristiano Ronaldo is a great player, one of the best in the World"
21.10.2011 » Iniesta: "Ronaldo is a great player, one of the best in the World"
One of Barcelona's main figures, Andrés Iniesta, talked about Cristiano Ronaldo in a recent interview published in "As.com". 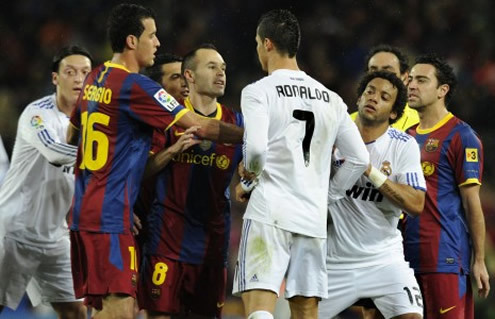 Despite not wanting to comment the reason why some fans keep booing the Portuguese player, Iniesta assumed that Ronaldo is one of the best players in the World. One of the pillars of Barcelona and a Spanish national hero for his World Cup winning goal in the 2010 final, Andrés Iniesta, granted an interview to "As.com" and recognized Cristiano Ronaldo status, as one of the best football players in the World. Iniesta also noted that he's not worried about competing for individual awards, since his priority will remain being the team's glory and success. Despite praising Ronaldo, Iniesta also outlined that his teammate, Leo Messi, is the best player in the World right now. After scoring a magical goal this last Wednesday, against Viktoria Plzen for the UEFA Champions League, Iniesta talked to the press about a few internal matters related to Barcelona, but avoided to share his view on the way Cristiano Ronaldo is welcomed in many stadiums. 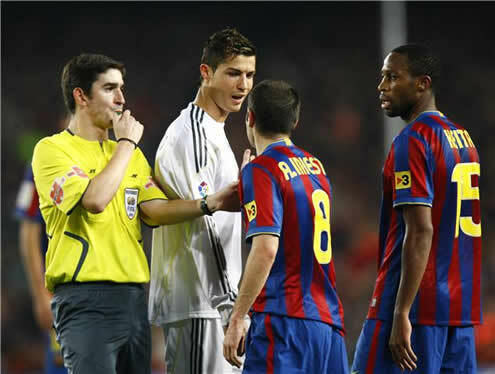 Iniesta: "I can't really say much about the way the fans react and what they think about Ronaldo. ", said the Spanish player who antagonistically gets applauded and cheered in many stadiums not only in Spain but also across borders. However, Iniesta had no problems in talking about Cristiano Ronaldo, when it comes to assess his football player quality and talent. 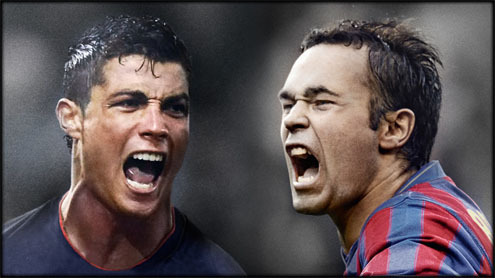 Iniesta: "In my opinion, Cristiano Ronaldo is one of the greatest. He's one of the best players in the World. ", pointed out Barcelona's midfielder. Andrés Iniesta is now 27 years old and has been playing in Barcelona since 1996, when he joined the Blaugrana coming from Albacete, being only 12 years old at the time. When a journalist asked Iniesta if he thinks he can be compared with Lionel Messi and Cristiano Ronaldo as one of the best players in the World, the Spanish midfielder showed his humble side, by ruling out his chances of fighting for that award. Andrés Iniesta has nothing but admiration for his Argentinian teammate, Lionel Messi, and sees no one else in the World capable to rival with him, at least at this stage. Iniesta: "Messi will always be Messi and I am who I am. We both only have to worry about giving our best to help the team. Currently, I think there are no doubts that Leo Messi is the number one. To be honest, these sort of things and comparisons don't worry me. What I care about is to be at my best, so I can help the team to keep winning trophies." Andrés Iniesta: "I'm not playing to be the best in the World and I couldn't care less if I am or not. I play football because this is my passion and I'm on the best club there is to do it. I get really happy for winning titles and to see how pleased our fans become with our success. I'm not playing to prove anything to anyone. 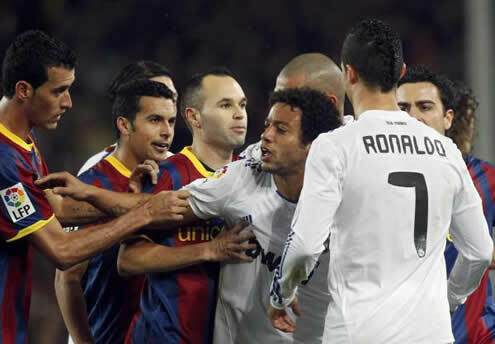 ", noted the Barcelona influential player. Real Madrid will now play against Malaga for La Liga, next Saturday. You can watch Malaga vs Real Madrid online, in our Soccer Live Streams section. The countdown clock timer, displaying the time left for the next Ronaldo game, is shown on the top right corner of all pages. Besides that game, you can watch Manchester United vs Manchester City streaming this Sunday, but the just day before, you can also follow Barcelona vs Sevilla live. All streamings are provided from our "Live" section.